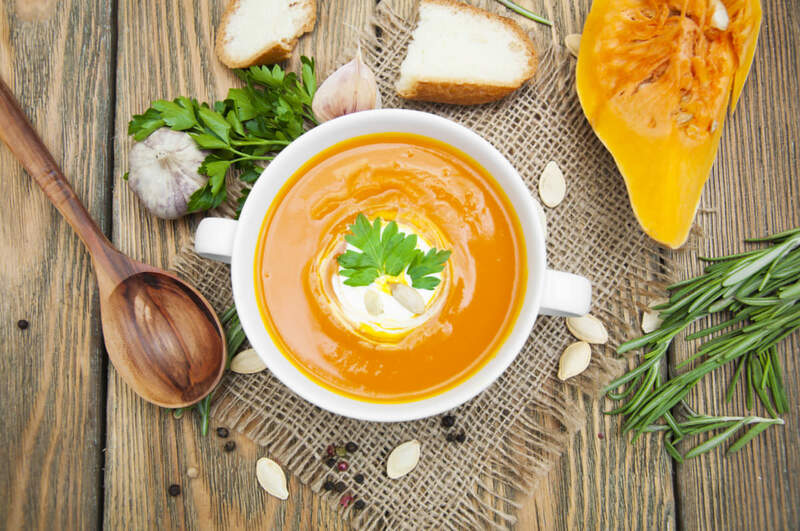 With fall in the air it is the perfect time to try this Instant Pot Pumpkin Soup. This pumpkin soup is so creamy and delicious, you will love this recipe especially if you use this recipe to make your own pumpkin seeds as a garnish too. You can watch all of the tips of how we made this instant Pot Pumpkin Soup on our live Facebook show that we do weekly on Mondays at 6 pm MST. We have so much fun making this recipe and found that the garnish on top of the soup was everything. You can Jazz up this recipe a lot by serving it inside a pumpkin at your next fall get together and allow your guests the option to add their own favorite toppings as they fill up their bowls! Using the Trivet, add 1/2 cup of water. Cook on high for 5-7 minutes with valve closed on manual setting. In a skillet heat avocado oil on medium/high heat. Add diced onions and saute until translucent. Add minced garlic, broth and use tongs to remove pumpkin from instant pot (be very careful when removing pumpkin as it will be hot. Add all ingredients to a blender. Blend. chop up celery and tomato, saute in the same pan that you used for the garlic and onion. Add celery, tomato, sour cream, and cilantro to the top of your soup. If you are new to the instant Pot, consider looking at our other Instant Pot recipes! Don’t forget to try our Sweet and Salty Pumpkin seeds recipe too! This post may include affiliate links, if you purchase an item it helps us continue our efforts on this blog. Thank you so much!